How much do you need to save each year to pay for your child’s college? 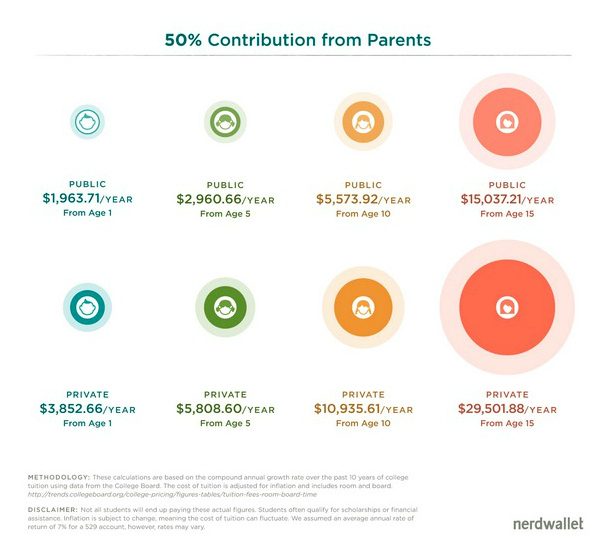 NerdWallet calculated the amounts based on average costs of college and expected increase in annual costs. Do you want to fund 50% of your child’s college costs? If your child is ten years old, then you’ll have to save almost $6,000 a year to pay half his costs to attend an in-state school. If you’d like to fine tune your calculations, try using the World’s Simplest College Cost Calculator from SavingForCollege. While a 529 plan is commonly considered the “best college savings vehicle”, this option does have some downsides. Investments in 529 plans grow tax-deferred and withdrawals are tax-free when used for qualified college expenses. Also, most states offer income tax deductions on contributions. Even if funds are not needed for the intended beneficiary, there are other options that let the owner escape tax penalties. • The earnings portion of withdrawals not used for qualified expenses is subject to ordinary income taxes and a 10% penalty. • It’s not for the short term. … one instance where the benefits of a 529 college-savings plan may not have time to accrue is for those that are looking at very short investment horizons—such as one year—before beginning to take withdrawals. The benefit of tax-free growth is very limited over such a short period of time in low-return, no-risk investments, and could be offset by investment expenses or plan fees in the short run. Plans will vary from state to state, which is a little more challenging for families. Therefore, you need to do your due diligence on the sales charges, fees, and investment choices by the plan administrator. • Limited investment options and higher fees. • Restrictions in moving funds between accounts. “The Experts: Are 529 Plans the Right Choice for All Families Saving to Send Their Kids to College?”, Wall Street Journal, June 5, 2013. 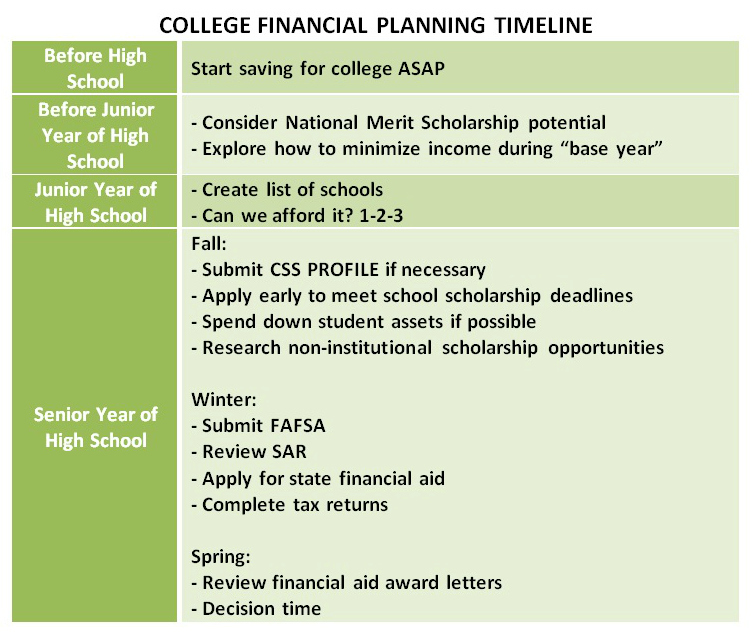 College financial aid letters have just been sent, and you may want to think about how to negotiate for more money. Many families don’t realize it, but there is often a little wiggle room in financial aid awards. FAFSA, the form the government and colleges use to determine need- and some merit-based aid, doesn’t capture all circumstances that might affect a family’s ability to pay for school. For instance, there’s no line to include the cost of caring for an elderly parent or special needs child, the kind of expenses that could warrant more aid, said Mark Kantrowitz, publisher of Edvisors.com, a college planning Web site. So if you weren’t able to share that kind of information with the school, now is the time to bring it up to see if that shakes free some more assistance. You can request a professional judgement review. If you do decide to negotiate, you can appeal to the school’s financial aid administrator for what’s known as a professional judgment review. Gather up every piece of documentation of any changes to your family finances or special circumstances that could impact your ability to pay for school. If the financial impact is significant enough, the school may adjust your child’s award. “Colleges are not car dealerships, where bluff and bluster can get you a better deal. Very few colleges will make a revised financial aid offer when a student gets a more generous financial aid offer from a competitor,” he said. But some schools, like Cornell and Carnegie Mellon, will consider matching offers of peer institutions. You “should be careful in the language and manner” of your approach. Danielle Douglas-Gabriel, “How to negotiate a better financial aid package”, Washington Post, April 2, 2015.